The RoughDeck HP-H best-in-class features are enhanced to deliver more reliability and higher performance than ever before. Available in 20,000 to 30,000 lb capacities, the RoughDeck HP-H is the industry leader for precision weighing in Legal for Trade applications. The Rice Lake RoughDeck HP-H’s best-in-class features are enhanced to deliver more reliability and higher performance than ever before. 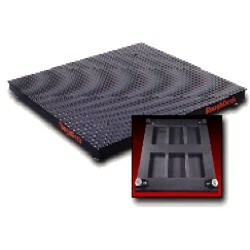 Available in 20,000 to 30,000 lb capacities, the RoughDeck HP-H high capacity floor scales available from Central Carolina Scale is the industry leader for precision weighing in Legal for Trade applications. The RoughDeck HP-H's NEMA 4 aluminum TuffSeal junction box is protected from forks and industrial abuse by a 6-inch structural steel channel frame and diamond treadplate safety deck. The junction box is also mounted as a handy slide-out tray that eases setup and service access. Cables include sturdy cord grips or a quick disconnect for added convenience. In addition, all load cell cables are enclosed in conduit, alleviating danger of rough handling. All load cells are recessed within the channel for protection on all sides, while maintaining easy access for leveling. w/ Quick Connector.. w/o Quick Connector ..